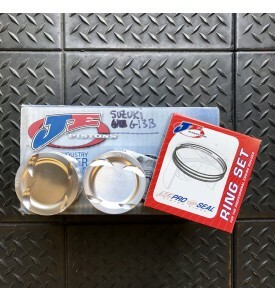 There are very few pistons that we cannot custom make for you either from our huge database of engine specifications or using a sample you provide to us. The only things we DO NOT make are Diesel and 2 Stroke pistons. Our Minimum bore diamter is 54.229mm with a .550 wrist pin for custom forged applications. Here is a breif list of some of the custom applications we have made pistons for. These are in addition to the common engines listed on our main JE part # listing. Ferrari 308, 365 GT 2+2, Etc. Porsche All AirCooled Flat 4 and Flat 6, Watercooled 924, 944, etc. Volvo B18 and B204, B23T, and 5 Cyl. 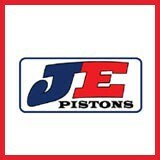 JE Pistons are the finest quality aftermarket forged pistons available. The special High Silicon 2618 aircraft alloy . allows much tighter Piston-To-Wall clearances ( Typically .0035-.0045 )than all the other manufactures. This means a quiet street engine that does not need excessive temperatures to seal. 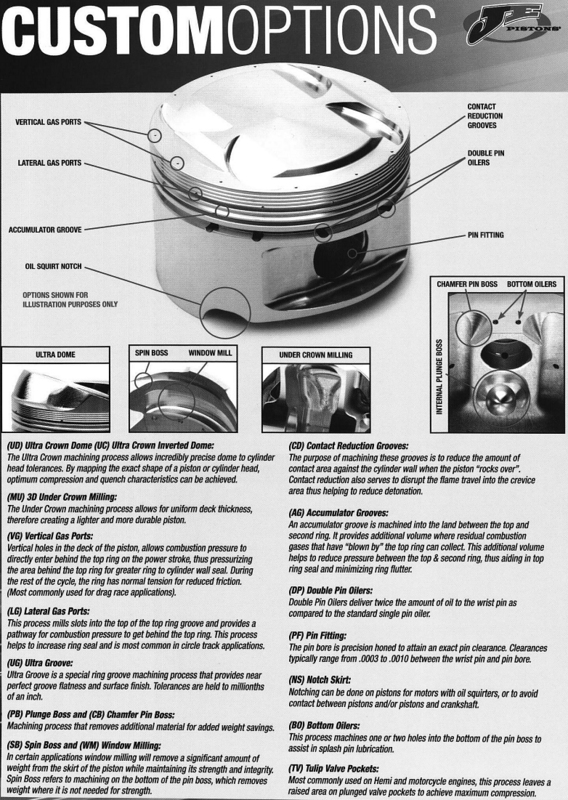 We offer and optional ($40.00 per piston at the time they are ordered or $49 per piston after they have been completed) High Heat Coating on Piston tops and Skirts. 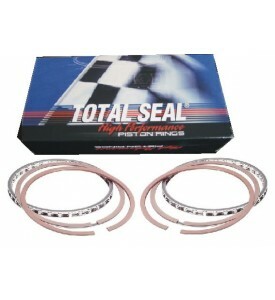 (A MUST HAVE for all NOS and High Boost Turbo engines..)You must specify this when ordering. It usually adds 7-10 days to the delivery time of a piston set. Last May I sent you some drawings for a set of Lotus twin cam pistons for your assessment. After a lot of delays I now have the new crank which is a work of art, so I’m ready to order the pistons. I’ll attach the drawings which have the bore size at a nominal 89.0mm. It’s actually 3.504”. I’m assuming that because they are to have piston-guided rods with a small end width of .725” we’ll have to use symmetrical forgings. So, along with the drawings these are the specs. 2 ring, Zero-gap compression ring, radial gas porting. Could you make these with your asymmetric forgings, piston guided rods - small end width is 25.0mm - coatings on crown and skirt, 2 rings, gas ported top groove with gapless ring, round wire locks, 2RH, 2LH. JE Custom Forged BMC 1275 Flat Top. 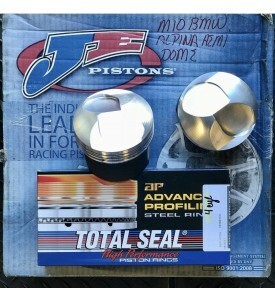 4 Cyl JE Custom Forged MGB Piston Set ANY BORE x 1.660 Flat Top. 4 Cylinder JE Custom Forged Piston Set - Flat Top for customer to mill own dish up to 4mm deep. LANCIA 2.0 16V Custom Piston Set.